It seems that at the moment in East Anglia, England, there are never ending rain storms. The weekend was awful with thunder and lightning and really heavy downpours. On Sunday evening, it came over completely dark, as if it were night time! There was the calm before the storm. Greg and I managed to go out while it was calmer and by the time we got home it was chucking it down. We had to shelter in the car for a little while, because it was too heavy to get out! I called it "fishy rain" when I was little - not because it smells, but because as it falls on the ground, it looks as though it's creating bubbles and I always thought that the fish had come out to play. 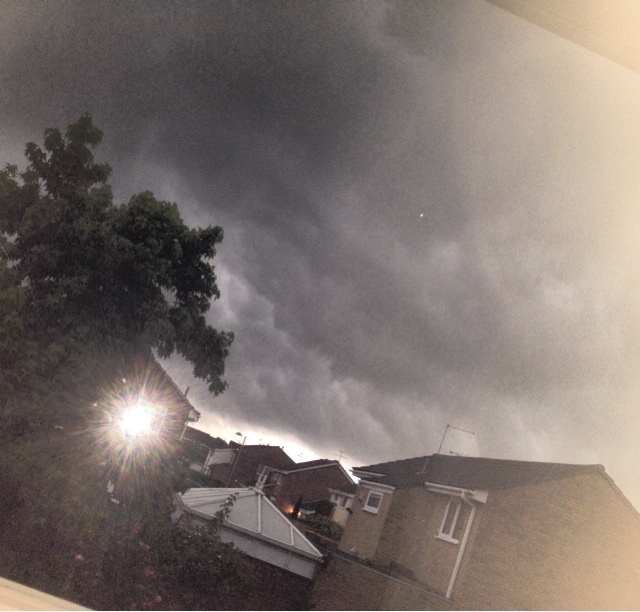 The sky was very dramatic - lots of flashes of lightning as well! 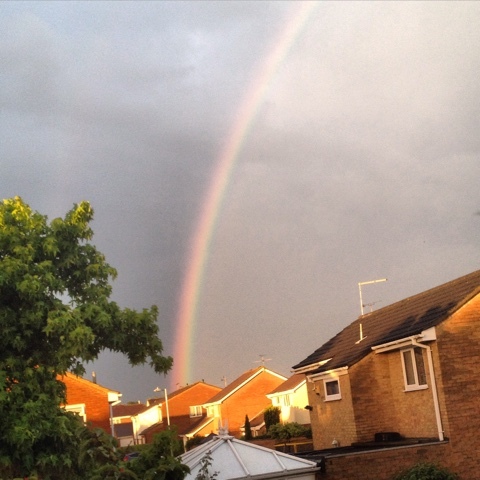 And then a beautiful rainbow as the sun came out! I was hoping that the rain would disappear and wouldn't continue on Monday as Greg and I were off to Aldeburgh, Suffolk. 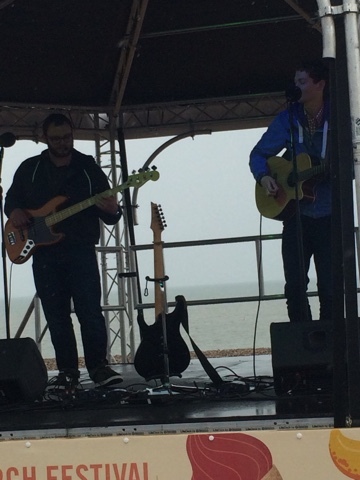 He and his friend (Matt) were doing a gig on the beach as part of the Aldeburgh Music Festival Band Stand on the Beach (and I was the tag along, the chauffeur, the cheerleader!) It was fairly okay on the journey there, then all of a sudden we hit a wall of rain, I drove straight into the storm! It was terrible! You could hardly see because the windscreen wipers wouldn't go fast enough to clear the windscreen quickly enough. The spray being kicked up off the road made it seem all misty and added to the visual problems already being caused by the lashing rain. 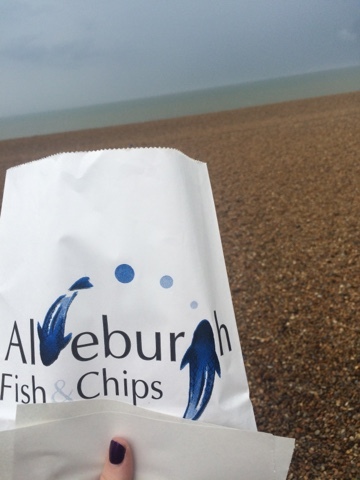 We finally made it to Aldeburgh, after an hour and a half in the car. We drove through the town for a while to find somewhere to park. Neither of us had any signal - which was a problem because we had to try and find Greg's friend. Luckily, he managed to get hold of him and we found where they were parked. Greg got soaked walking 50 yards to their car. Greg and I had yet to eat any lunch and we'd planned to have fish and chips (of course, we're British and at the seaside - what else do you eat?) I drove us to the other end of town to the car park we'd first found, as that was nearer to food! We also both needed the toilet and there was one in the car park. So I parked as close as I could to the toilet building. The rain was terrible so we took it in turns to make a dash to it. We then sat in the car to let the rain pass for a while. It did eventually wear off (yay as by sitting in the car, we'd got very hungry!!) and we managed to go and find food, in the dry. 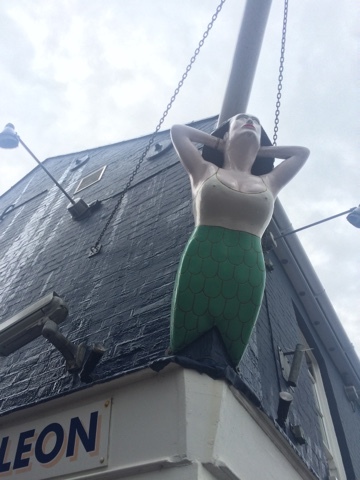 We went to the Golden Galleon - a lovely little fish and chip shop. It was really yummy! The rain managed to hold off enough so that we could eat lunch standing on the beach. 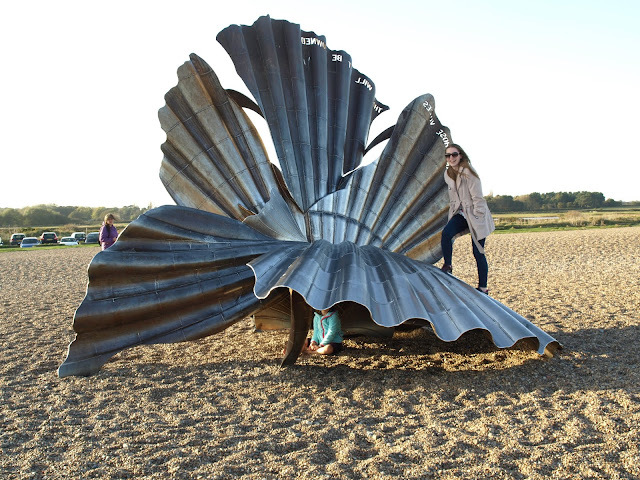 Aldeburgh is a lovely beach, it has layers of stones and a lovely statue to commemorate Benjamin Britten - the English composer! As soon as we had finished our chips, the heavens opened again! Greg and I had to do a mad dash back to the car to get his instruments as it was time to set up! We've also come to the decision that we need to invest in a Golfing umbrella, as my tiny little one from Paperchase, as lovely as it is, is only suitable for one person - not for the both of us. Safe to say we got soaked and needed a change of clothes. 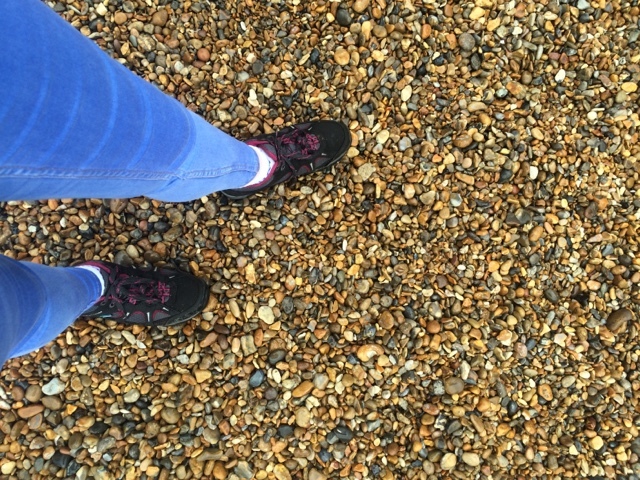 Even my walking boots - supposedly waterproof, got soaked through and my feet were all soggy. I drove Greg closer to the bandstand to unload the car of the instruments so he could set up, then I drove back to the car park and walked to him. I was completely soaked when I got back to the beach! I even had to stop off on the way to the beach and get myself a new hoody because my one was completely wet and I was very cold. I popped into Jack Wills (the only shop I knew would have them in store) and saw that they had 25% off - which was good, made me very happy! 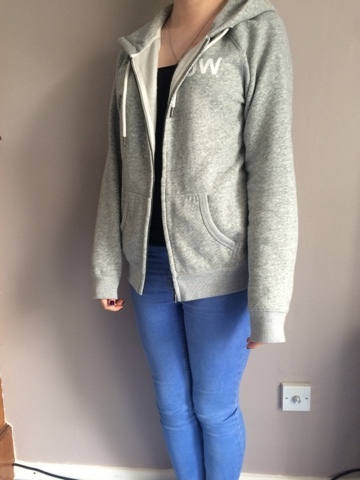 Now I have a hoody that is actually my own and not one I've "borrowed" from Greg! 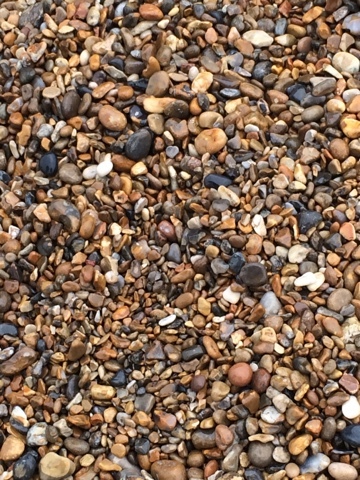 The stones on the beach were really pretty! 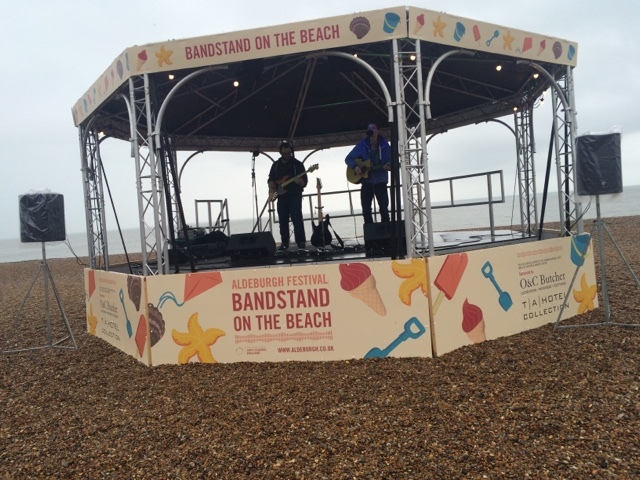 I stood on the beach, in the rain, listening to them playing for an hour! I could listen to them for ages. It was a lovely venue and as Matt said, the British go out in all weathers, so no one really minded. 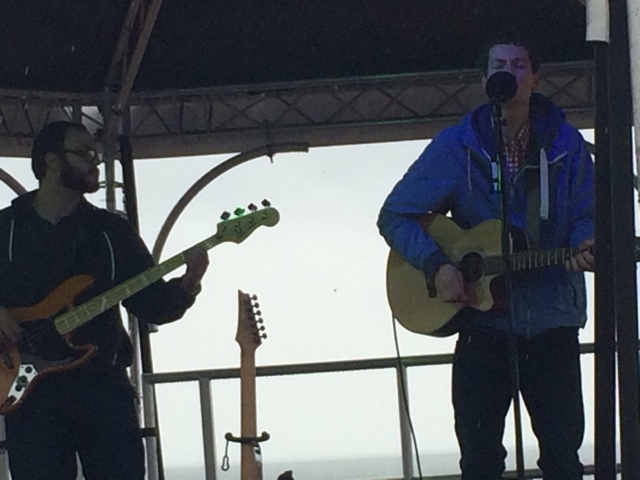 It did get a bit chilly though! Check out more of Matt's music here! As soon as they finished playing, it decided to rain even harder (which was quite good because I didn't want to stand there in that!) We headed back to the car and before we left, we had to make a stop in the Adnams of Southwold shop, of course. Then we travelled home in the rain and had a little pizza, film party.